This NASA/ESA Hubble Space Telescope image shows a cluster of hundreds of galaxies located about 7.5 billion light-years from Earth. The brightest galaxy within this cluster named SDSS J1156+1911 and known as the Brightest Cluster Galaxy (BCG), is visible in the lower middle of the frame. 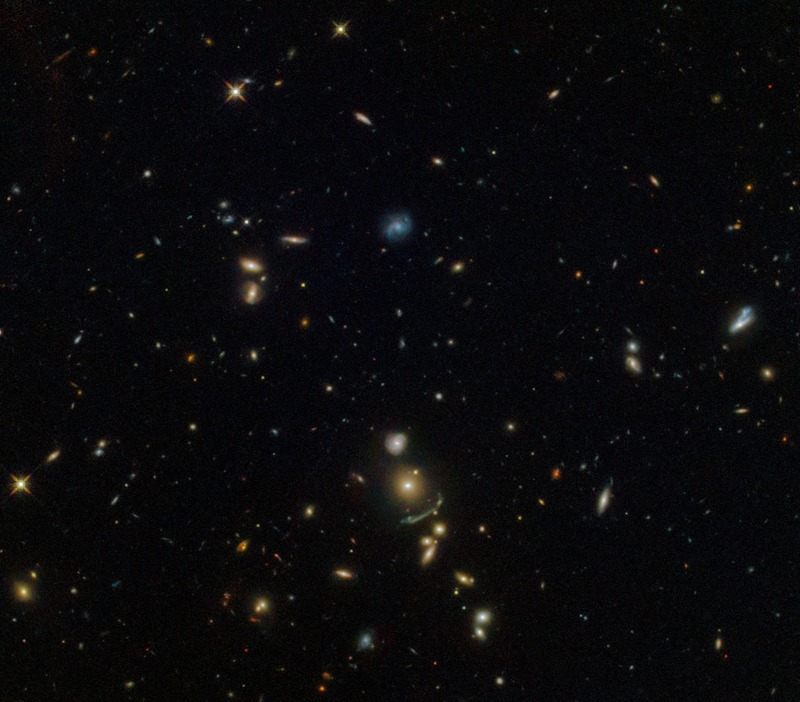 It was discovered by the Sloan Giant Arcs Survey which studied data maps covering huge parts of the sky from the Sloan Digital Sky Survey: it found more than 70 galaxies that look to be significantly affected by a cosmic phenomenon known as gravitational lensing. Gravitational lensing is one of the predictions of Albert Einstein's General Theory of Relativity. The mass contained within a galaxy is so immense that it can actually wrap and bend the very fabric of its surroundings (known as spacetime), forcing the light to travel along curved paths. As a result, the image of a more distant galaxy appears distorted and amplified to an observer, as the light from it has been bent around the intervening galaxy. This effect can be very useful in astronomy, allowing astronomers to see galaxies that are either obscured or too distant for us to be otherwise detected by our current instruments. Galaxy clusters are giant structures containing hundreds to thousands of galaxies with masses of about over one million billion times the mass of the Sun! SDSS J1156+1911 is only roughly 600 billion times the mass of the Sun, making it less massive than the average galaxy. However, it is massive enough to produce the fuzzy greenish streak seen just below the brightest galaxy—the lensed image of a more distant galaxy.